Welcome back to my Interior Design Inspiration blog. Today we’re continuing our tour of the 2014 Hampton Designer Showhouse by visiting one of the many bedrooms on the second floor. 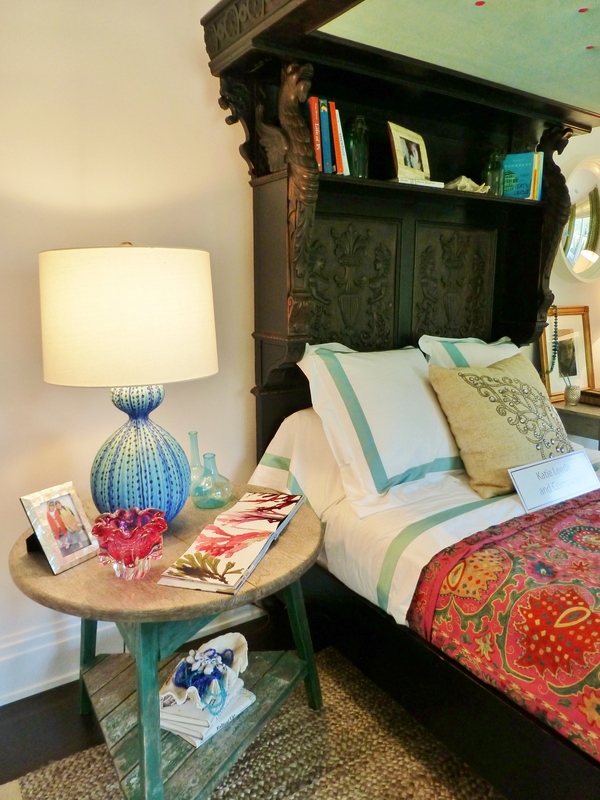 Katie Leede designed this colorful exotic bedroom with her 19 year old daughter in mind, using a fabulous antique Jacobean bed as the centerpiece. You know how I love antiques…well I think this bedroom is just phenomenal! Here’s an image of the fabulous window treatments. The designer chose to use woven wood shades under bold green dotted drapery panels. A turquoise cornice board with a detailed beaded tassel fringe adds an exotic, yet rustic feel. I really like the bold color combined with natural elements which gives the room an almost tropical vibe. That long rustic wooden bench is really interesting too—adding to the textural feel. It’s wonderful how the light just falls down upon it from the window! Here’s a view through from the bed. Check out the inside ceiling of the bed canopy: isn’t it cute having hot pink contrasting buttons up there, to pull out the pink in the colorful ethnic bedspread? I also like the cornered tufted sofa across the room, used with Flokati-covered antique stools to create a little sitting area. The large artwork above the sofa sparked quite a lot of buzz amongst visitors…many felt that the naked female subject looked pained or that the artwork was disturbing in this bedroom. What do you think? To the right of that fabulous Jacobean bed (which acts almost like sculpture in the room) the designer placed a small desk, which also serves as the night stand. That textural blue and turquoise gourd lamp is amazing!! And the upholstered chair with the rolled back is stunning too! I also admire how Katie Leede scattered furry hides on top of the woven Jute rug, to add texture, warmth and softness. At the left side of the bed, a primitive round table was used with a matching gourd lamp (those lamps have such amazing color and texture!). The bedspread is so colorful and fun in contrast to this serious dark bed. The carving on the bed is magnificent! Did you notice that great little shelf inside the top of the headboard? What a terrific place to store books and cherished items. This antique bed is like a room within the room! I’ll leave you with this final image, looking back toward the entrance. Did you notice the cool lantern that’s swagged across the ceiling? I really like the knotted cord cover, which gives it a bohemian feel. The cover appears to be made from the same fabric that covers the buttons inside the bed canopy. Also in this image, you can appreciate those draperies one more time. Notice the contrast banding at the hem, in the same fabric used to fabricate the cornice. So pretty! I love details like these. 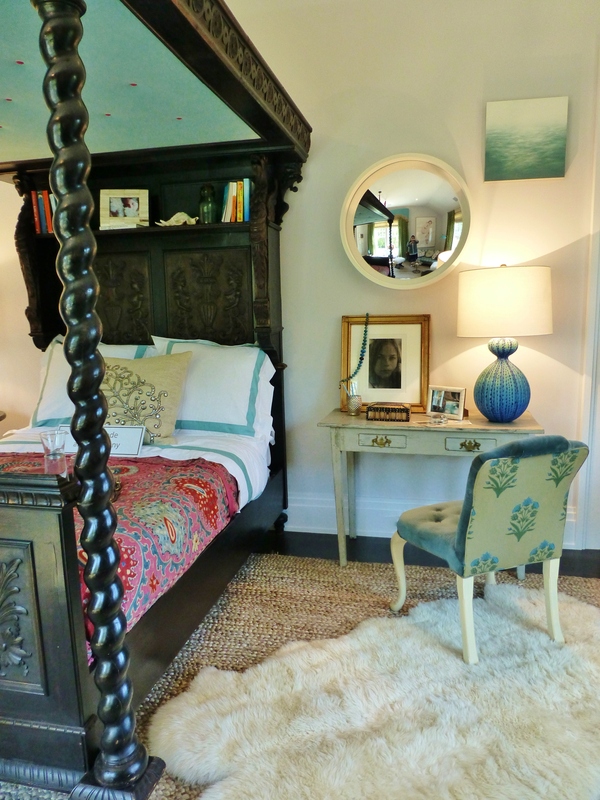 What did you think of this exotic guest bedroom in the 2014 Hampton Designer Showhouse? 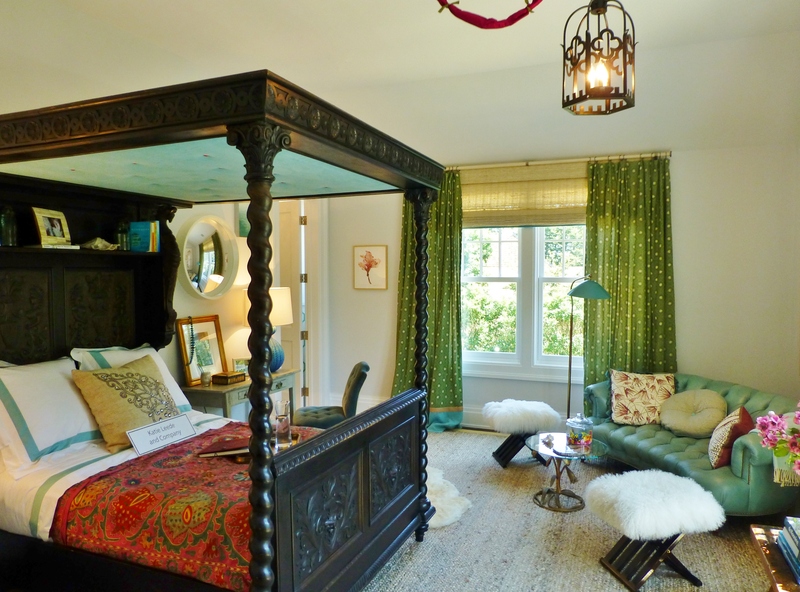 I thought it was fabulous…and I loved the use of antiques mixed with ethnic textiles and bold colors. This room proves that using serious antiques (even those with dark wood and heavy carving) needn’t be old-fashioned or stuffy. I think this bedroom feels youthful and vibrant with a Bohemian feel. Katie Leede is one ofTraditional Home Magazine’s “Ten Young Designers to Watch” and she’s been published in many top shelter magazines. I truly admire her work! 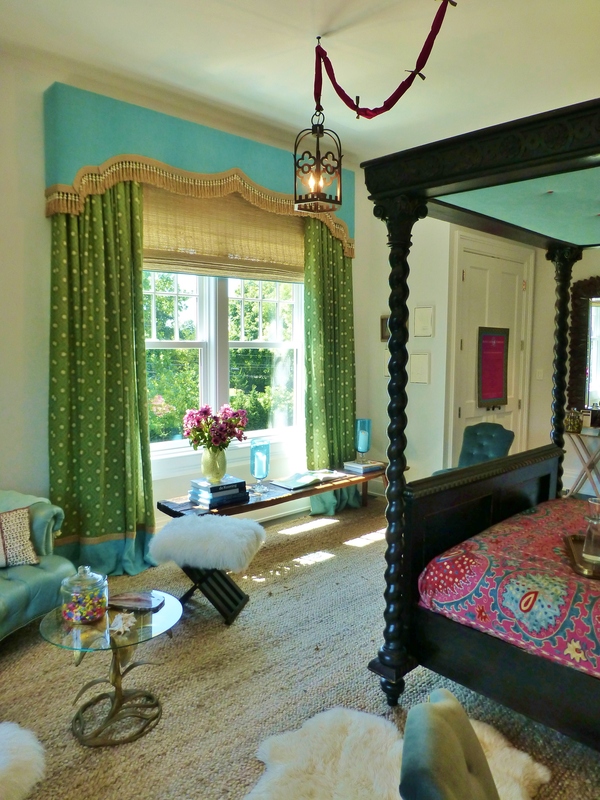 This entry was posted in Antiques, Bedroom, Interior Design & Decorating, Robinson Interiors, The Hamptons and tagged Bed, Draperies, Flokati, Green, Hampton Designer Showhouse, Home, Jacobean, Jute, Katie Leede, Kristine Robinson, Lantern, Turquoise. Bookmark the permalink.